If you happen to be the leader of a nation, a celebrity, richer than god or simply paranoid, Mercedes has the automobile for you. 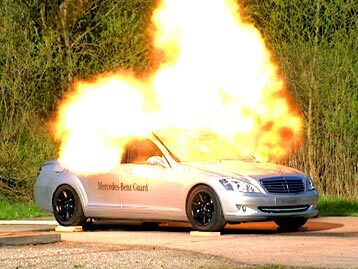 The new Mercedes S600 Guard has factory-integrated preventive measures such as military-grade armor which can resist small arms projectiles, shrapnel and explosive charges as well as bulletproof glass. A self-sealing fuel system and fire-extinguishing technology help automatically contain any vehicle fires. Even the tires are designed to run flat in an emergency. An emergency fresh air system can even be equipped to counter any noxious gas substances and provide clean air to the passenger compartment. Beyond the security features, the S600 Guard is no slouch in the performance department, featuring a 517 horsepower V12 bi-turbo engine under the hood. The car also includes a wide variety of high-tech features which are standard on the Mercedes S-class, including radar-assisted braking, a preemptive airbag system that can detect an impending crash before it occurs, and infrared headlights which provide night vision on an in-dash video screen.